Hello, High 5-er! Can you believe we are in April already! The year is flying by! March was a big month for High 5 Casino, having FIVE new games added to our Casino lobby. Now High 5-ers are able to choose from 246 different slots! We also continued our weekly themed XP events, introduced new and improved Player Challenges, and added some new tournament games! You can now play, Russian Wolf, Joker’s Riches, Tiki Idol, Lucky Pug, and Glory on Ice as tournaments by visiting the Tournament Lobby at any time! With all these spin-tastic events March 2018 brought, High 5-ers spent over 3 million hours spinning the H5C reels over 2 BILLION times! 1. Leona S. won 200 Billion playing Banana Splits! Most-played tournament: Joker’s Riches, Hi-Lo Tournament! 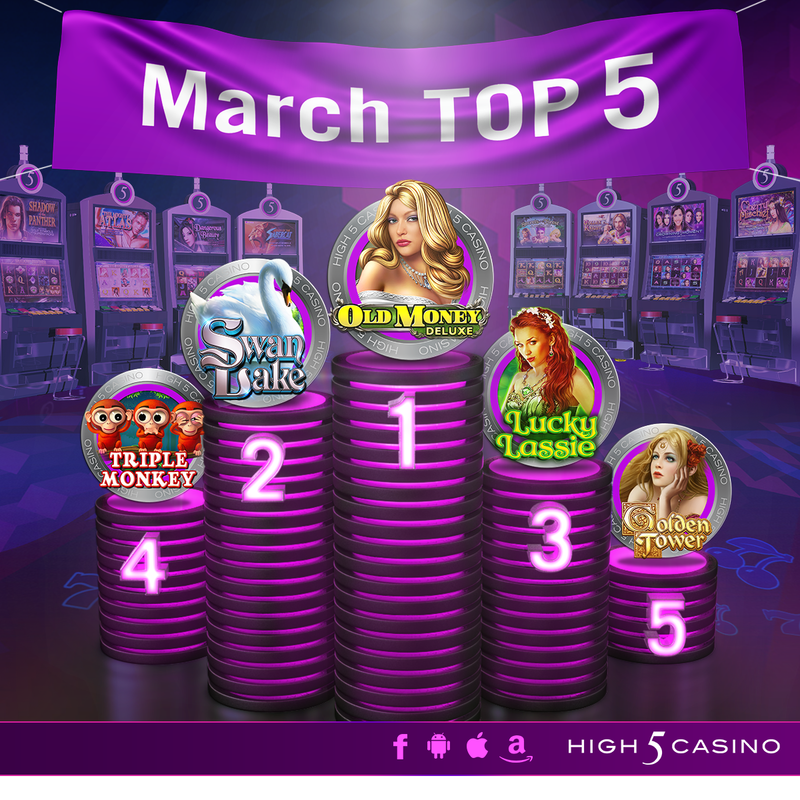 Top 5 most played games for March: Old Money Deluxe, Swan Lake, Lucky Lassie, Triple Monkey, and Golden Tower! Which game gave you your High 5 Moment in March? Are you enjoying the new tournament games? Comment in the conversation bubble located on the top right corner of your screen and let us know! This entry was posted in H5C Stats, High 5 Casino, High 5 Games, High 5 Moments, top games and tagged Android, App Store, Apple, Facebook, Free Games, game preview, Google Play Store, H5C, High 5 Casino, High 5 Casino Mobile, High 5 Games, High Limit games, iOS, iPad, iPads, iPhone, iPhones, slots, social gaming, statistics by hoothigh5. Bookmark the permalink.